This book describes 29 competence elements for project managers. 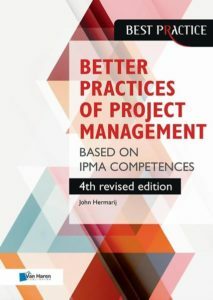 It uses the Individual Competence Baseline (ICB4) of the International Project Management Association. The ICB is a competence standard and it helps you to reflect on your own competence as project manager, so you can identify those areas that need some development. All videos are a sample of our eSchool in which all theory is explained more in depth, together with quizes, interaction with your eTrainer. Both in Dutch and English, there is a Dutch version of the book available too. For more information surf to Dhirata>>.